Street of Dreams Opens Saturday! One of our favorite summer traditions is back! 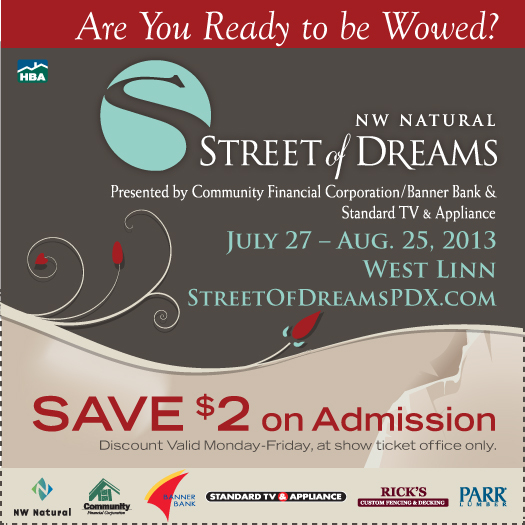 The 2013 NW Natural Street of Dreams returns for the 38th consecutive year with nine, acre-sized properties featuring the latest innovations in home design. The show starts this Saturday, July 27th. The location is in the Stonehenge neighborhood of West Linn, known for spectacular sunset views over Lake Oswego. The show runs daily from July 27 through August 25, 10 am–9 pm, with ticket sales ending at 7 pm. Print off this coupon for $2-off coupon valid Monday – Friday at the show ticket office only. going green: why mountainwood homes? We enjoyed seeing the great turn out and meeting everyone at the Portland Renovation & Remodeling Show at the Memorial Coliseum! If you missed it, or if you’re ready for more inspiration we wanted to make sure you knew about the next Home & Garden show taking place in February.